If you are my friend and you read this blog, then at some point in your life I’m guessing that you suffered from a hangover (or what my mom calls "The Bonkowski Flu" - that means you aren't hungover...you're "sick"). The room is spinning, you head is pounding, you can’t get comfortable, you can’t sleep, you are nauseous. We’ve all been there (some of us last weekend or even today – what can I say, my friends are awesome). While my hangover secret is simple – Coca-Cola (not diet, regular) – I’ve been seeing a lot of blogs link to this recipe for Hangover Pizza. I love this concept! Hangover Pizza would be awesome to make after a friend’s birthday, during the holidays (Thanksgiving morning after a wild night out before) or even on New Year’s Day! Heck, for me, this is great for this Saturday or Sunday or Monday…I kid! About 30 minutes before baking the pizza, preheat oven to 500 degrees and place a large rimless or upside-down baking sheet in the lower third of the oven. Roll out dough on floured parchment paper, place on baking tray and bake for 8 minutes, popping any bubbles that pop up while cooking. Spread softened cheese, salt and pepper on the baked dough. 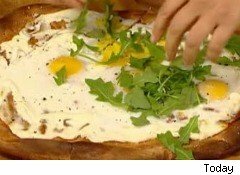 Top with arugula and crack the four eggs on top. Place pizza back in the oven for three to five minutes until the eggs are cooked. 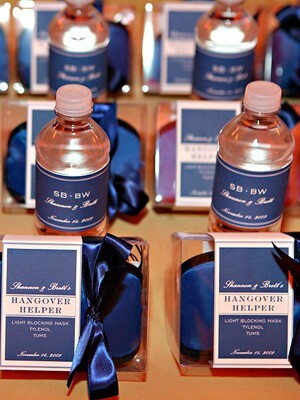 Oh and speaking of hangovers, how cute is this party favor? Perfect for a wedding or New Year's Eve party! The kit includes a light blocking mask, Tylenol, tums and a bottle of water! Genius! I don't have the motor skills to put together a pizza when I'm hungover and I'm not dedicated enough to make one before I go out drinking. Lol. I am gonna stick to McDonald's cheeseburger with a vat of Coca Cola. But that pizza does look really delicious. Leanne!While I can totally relate, next time you foresee a hangover, may I suggest making most of it ahead and bake it in the morning!? I may try that this Saturday / Sunday!